I have always been into video games and anime, or cartoons in general. But it wasn't until I played Final Fantasy X in the 6th grade that I began wanting to cosplay. Yuna was my absolute favorite character (and to this day is still one of my favorites) and inspired me to want to dress up like her. I adapted my interest into "dressing" like final fantasy characters. I often wore three belts like Squall did from FFVIII, and similar things like that. However, my first technical cosplay was Seifer from FFVIII. He was my favorite character from that game and I thought it would make a great halloween costume. 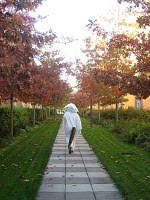 Here is me as Seifer for Halloween. I grabbed a trench coat at good will and tried to dye it grey but that was epic fail. I made a gunblade out of cardboard and foil and colored it with sharpie. I bought a fake scar and put blonde hair gel in my hair. Overall, it was a very cheap costume. My second attempt at cosplay came quite a bit later. I was busy with school but not busy enough to keep me away from video games and anime in general. I continued my passion and eventually cosplayed as Haruno Sakura from Naruto my senior year of high school, four years after the Seifer costume. 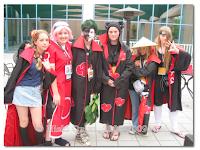 Here I am with a group of Akatsuki that found me outside in Fanime. This was my second time attending a convention and after my first, I definitely wanted to cosplay. I loved Sakura in Shippuuden, but wasn't confident enough to do that outfit. So I settled for the old one. My uncle did most of the sewing for this one but I made some major observations. After Fanime 2008, Sarahceratops and I decided we would work together to make some epic cosplays for the next year. It was hard, considering it was our first year in college and so far away. I got a sewing machine for graduation but obviously had no idea how to use it. With no use of a pattern, I measured myself and made sketches in my sketch book. 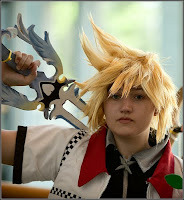 With help and tips from cosplay.com, I managed to scrape together a Roxas cosplay from Kingdom Hearts II. It was definitely a learning experience for me. I was so proud that I had a decent cosplay for my very first attempt at sewing. Best of all, I had the sickest props to go with it. The keyblades took more hours than the cosplay itself, and I was very proud of the overal costume. The only things I would change: update the wig, and slim down the innter vest a bit - it was bulky. And maybe redo the collar of the outer jacket. For summer 2009, the Harry Potter : Half Blood Prince premier was coming up and I really wanted to dress up for that. With some assistance from my mother (donation of white shirt and sweater), I was able to cosplay one of my favorite characters: Nymphadora Tonks. I didn't want to do the cliché gothic/punk look she is depicted as in the movies - I wanted to stick more to the books. So I cosplayed Tonks as she was at Hogwarts - a rebel punk of a Hufflepuff. I had the shoes and the skirt and the wig left over from another cosplay. But I basically started from scratch for the rest. I completely sewed the cloak with small help from a pattern I got from a recommendation of an old lady at Hancock Fabrics. I ordered the tie and socks online, and added ribbon to the tie and sweater. I couldn't get a decent patch for the cloak on time so I actually glued on a print out on paper. Overall it was super fun to cosplay such a bubbly character. It was so different from Roxas! During my sophomore of college I wanted to cosplay as Max from Where the Wild Things are. In a short two days, I quickly sewed together a comfy costume for the premier of the movie and for halloween. I made a lot of mistakes, and there is a lot I would change, but I'm sure this costume will retire soon. These are the costumes that lead up to the creation of this blog, and I look forward to posting updates and tutorials to share with you all!